Early voting for the March 15 Presidential Preference Primary, Holiday Park Park & Recreation District Election and Town of Longboat Key Bond Referendum will begin on Saturday, March 5, and continue through Saturday, March 12, the Sarasota County Supervisor of Elections Office has announced. Sarasota County Terrace Building, located at 2001 Adams Lane in downtown Sarasota. Since Florida is a closed primary state, only registered Democrats and Republicans are eligible to cast ballots in their party’s Presidential Preference Primary, the news release explains. 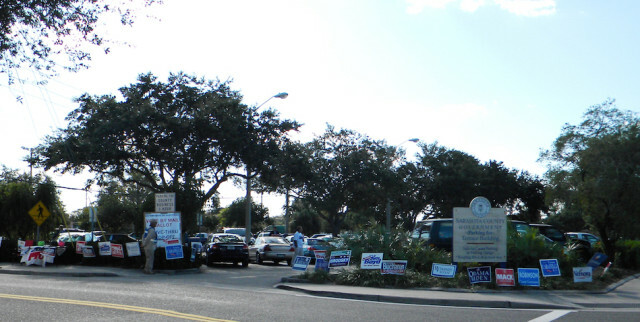 However, registered Longboat Key and Holiday Park voters with no or minor party affiliation are eligible to vote in their respective elections, the release adds. Florida law requires each voter to present a photo and signature ID upon entering the polling place and prior to voting, the release points out. “A voter who appears at a polling place without photo and signature ID will be allowed to vote a provisional ballot,” it says. Voters who have questions may contact the Supervisor of Elections (SOE) office at 861-8600 or visit the SOE website at www.SarasotaVotes.com.